Peter Gethers has loved food and wine all his life, and now he wants to give his 93-year-old mother a final gift: a spectacular feast featuring all her favorite dishes. Problem is, he doesn’t know how cook most of them, so he embarks upon a culinary journey that will ultimately allow him to bring his mother’s friends and loved ones to the table one last time. The daughter of a restaurateur, Judy Gethers discovered a passion for cooking in her 50s. In time, she became a mentor and friend to several of the most famous chefs in America, including Wolfgang Puck and Jonathan Waxman. In her 80s, she was robbed of her ability to cook by a debilitating stroke. But illness has brought her closer than ever to her son: at least twice a week, Peter visits her so he can make her dinner, ask questions about her colorful past, and learn her kitchen secrets. Gradually his ambition becomes manifest: he decides to learn how to cook his mother the meal of her dreams and thereby tell the story of her life to all those who have loved her. 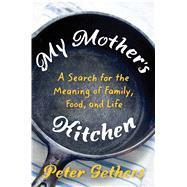 With his trademark wit and knowing eye, Peter Gethers has written an unforgettable memoir about how food and family can do much more than feed us—they can nourish our souls. Peter Gethers is an author, screenwriter, playwright, book publisher, and film and television producer. His previous books include The Cat Who Went to Paris, the first book in a bestselling trilogy about his extraordinary cat Norton. He is also the co-creator and co-producer of the hit off-Broadway play, Old Jews Telling Jokes. He lives in New York City and Sag Harbor, New York.